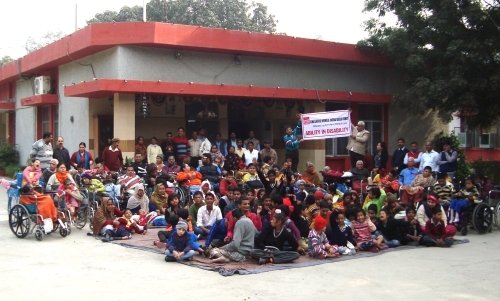 Cheshire Home India – Delhi Unit was established in 1957 and since then we have been a part of many disabled peoples lives. Our core activity has been to care for disabled residents and help them live a life of dignity. However, with time Cheshire Home India – Delhi Unit has grown and evolved to provide comprehensive need based services to children and adults with disabilities including but not limited to provision and/ or facilitation of special education, physiotherapy and occupational therapy. At the Cheshire Home India – Delhi Unit, we have 79 exuberant personalities residing with us along with a host of dedicated staff. We are also running a learning center with 70 physically and mentally disabled children from slums all over Delhi. In addition, we are now in the process of establishing a livelihood program for the employment and empowerment of disabled persons. Each Person, whatever his or her disability, is a uniquely valuable individual and that people with disabilities should have personal freedom to pursue their aspirations and take their own place in the world. To assist people with disabilities regardless of their colour, race or creed, by providing the conditions necessary for their physical, mental and spiritual well being. Empathy, Integrity in all actions, adhering to highest standard of professional conduct.